The St. John Fisher men’s volleyball team ended the program’s inaugural season with a loss to Juniata College. With the loss, Fisher dropped to a 13-16 record, while Juniata improved to 17-12 overall. Though Fisher jumped out to a first set victory, it couldn’t keep the pace with Juniata. Fisher ended up losing the final three sets, 25-22, 25-21 and 25-16. The Cardinals couldn’t keep up as the team came up short in points, kills, assists and digs. Juniata had a game-high 13 blocks as its defense controlled the game. Ben De La Cruz led Fisher with 14 kills and three aces, while Paul Hackford had a game high, 38 assists and 11 digs in the game. The Cardinals finished conference play holding a 1-8 record. The St. John Fisher baseball team won a thriller on April 11 on the grounds of Dugan Yard at St. John Fisher College. 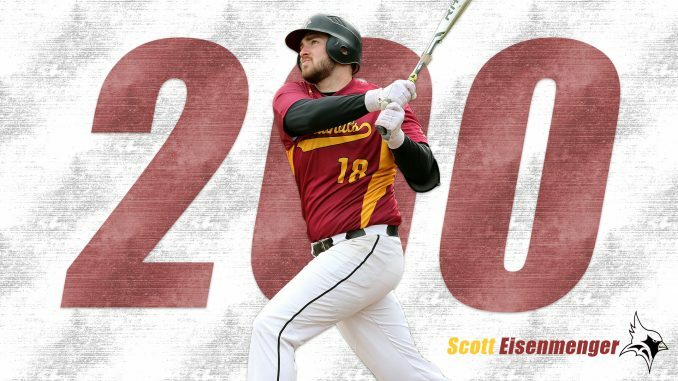 Scott Eisenmenger recorded his 200th hit as the Cardinals defeated Brockport 10-6. Jared Wren pitched five innings and gave up nine hits including six runs. In the first four innings, Wren only gave up one run, while the Cardinals powered their way to an early 5-1 lead. The momentum shifted quickly as Wren gave up several runs to tie the game at 6-6. Junior Matt Toohey took the mound. Brockport couldn’t find its groove as Toohey got his first win on the season while pitching two innings and gave up no hits. With the game still tied, Eisenmenger stepped up to plate with one on and connect one over the left field parking lot. That gave the Cardinals a 10-6 lead going into the top of the ninth inning. Sophomore Dillan Wilkinson stepped up to the mound to try and seal the win and that is exactly what he did, with three quick outs. The Cardinals improved to 16-7 on the year while Brockport evened its record at 12-12. Fisher is back in action April 13th at 1 p.m. vs Stevens Institute of Technology as the Ducks will travel up for a conference matchup at Dugan Yard. The St. John Fisher baseball team was back in action April 7 on the grounds of Volpe Field at Scranton College. It was Anthony Brophy that led the Cardinals and improved to 3-1 on the season. Brophy pitched seven innings with five strikeouts and only one earned run. Justin Graham gave the Cardinals’ offense some power as he recorded a hit and two RBIs to complete the win over Scranton in game 1. The Cardinals powered their way to a 7-1 victory in game two. Fisher’s offense wasn’t denied again as the team tallied a game high 10 hits. It was about defense for both teams, as the game was scoreless through the fourth inning. Both teams gave up one run each and then Fisher dominated the final five innings combining for six runs. R.J Kuruts took the start and got his third win of the season. He improved to 3-1 overall. Scott Eisenmenger led the Cardinals with a total of three hits on five at bats along with two RBIs. Fisher improved to 14-7 overall as Scranton fell to 8-8. The Cardinals are still atop the Empire 8 conference standings, holding first place with a 5-1 record. The St. John Fisher men’s lacrosse team traveled to SUNY Geneseo on April 9 where they were defeated 9-8. Fishers’ defense couldn’t control Geneseo’s fast pace offense as the Cardinals found themselves in a quick 2-0 deficit. Jack Mulvihill gave a spark for Fisher as he scored right before halftime as they were down 4-2. As the third period began, Fisher still couldn’t seem to stop the Knights as they once again scored two quick goals. Fisher kept battling and soon found an answer. Four goals in a little over four minutes for the Cardinals gave them the lead, 6-5 with six minutes left in the third period. The Knights answered back and scored four straight and never looked back. Chance Gates and Jack Mulvihill sparked one last run for Fisher but would fall short, 9-8. With the loss, Fisher fell to 7-5 on the season as Geneseo improved to 5-4 overall. Jack Mulvihill led the Cardinals with three goals of his own. The Cardinals’ next home game is against Utica College Saturday, April 14 at 1 p.m. The St. John Fisher men’s lacrosse team won a major conference game on April 7 as they defeated Alfred University 9-5. Both teams battled in the first quarter while the score at the horn was 4-4. Fisher increased their lead, 5-4 at halftime. As the third quarter began, Fisher took the game over as they went for three goals and held Alfred scoreless. The final 15 minutes of play went back and forth as both teams gave up one goal. Fisher took the game 9-4. Nick Miller led the Cardinals’ offense with a game-high four goals, while Zach Wagner chipped in three of his own. With the win, Fisher improved to 1-2 in conference play and 7-4 overall, while Alfred fell to 2-1 in the conference and 6-5 overall. The Cardinals tried for another key win as they traveled to SUNY Geneseo on April 9. The St. John Fisher College women’s lacrosse team won a key matchup conference battle against Nazareth College on April 11 under the lights at Growney Stadium. Fisher took an early 3-1 lead in the first half as Mackenzie LeVan scored two of her own as she put the Cardinals up. As Fisher scored again by a goal from Claire Bollin, the score increased to 4-1. Nazareth wasn’t backing down, as they made a comeback to bring the score to just one at halftime, 6-5. Fisher’s defense came out in the second half struggling as Haley DeVona and Jamie Martin gave Nazareth a 7-6 lead. The Cardinals’ offense found a way to get on the scoreboard fast as they scored four goals in under four minutes to put them back up in front, 10-7. Nazareth found themselves one more goal but it wasn’t enough as Fisher won 11-8. With the win on Wednesday night, Fisher improved 8-2 overall while Nazareth dropped to 7-5 overall. Fisher’s next game is April 14 at 1 p.m. as the women travel to Rensselaer Polytechnic Institute to take on the Sage Colleges in another critical conference game.